The most popular Austrian company, in regards of PC components, never seizes to stop making newer and better products. 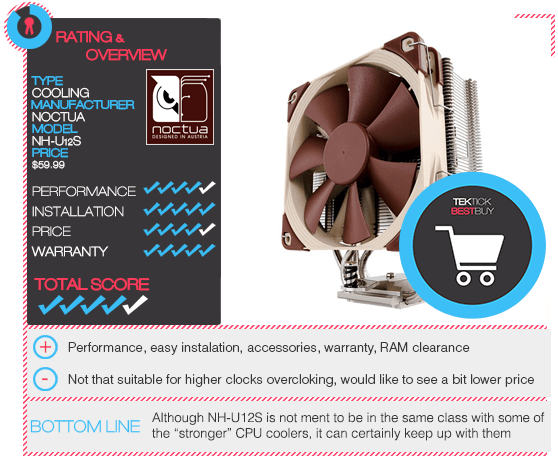 Noctua has made a reputable brand of itself for the last couple years and has become an undoubted premium manufacturer of CPU coolers and fans. Their products are above average in almost everything, starting from build quality, performance, noise level, as well as their (higher) prices. As of it, their products are rarely seen winning a best-buy category rather than winning a best-performer category of its class, and that’s almost every time when they release a new product. Their sleek looking coolers are sometimes left in the shadow of not so good looking fans, whose color scheme makes this company recognizable, but which are on the other side known for their indisputable performance, build quality and, again, one of the higher priced consumer fans on the market. Although higher prices of their product are easily classified as justified purchase just taking into consider everything that we’ve mentioned in a few sentences before, to additionally ease down your uncertainty and legitimate your purchase there’s a 6 year warranty and a first-class support. Today we took a detailed look of their newest products, the NH-U14S and the NH-U12S, as well as some of their range of fan products. Both of them a single-tower design, similar design but different sizes and number of heat-pipes. Bigger is better, especially when it comes to CPU coolers, the more (good quality) heat-dissipating surface you’ve got, the more you will bring you CPU’s temperatures down. Considering that we’re holding onto a two Noctua products, we’ve raised the bar pretty high, but on the other side we are certain that we won’t get disappointed. Both product box are identically designed, expect for the obvious reason where’s NH-U14S box bigger than NH-U12S. Boxes are pretty sturdy, they kinda lack a kind of “cool” design, but we don’t mind cause you can tell that it’s a serious product approach in question. You can “smell” Austrian engineering and meticulousness. Just like Thermalright, it’s obvious that Noctua would rather invest more in design of cooler itself than an arty product box. Walking around the boxes you will introduce yourself with a pretty detailed specification and feature set of the products that waits you inside. Inside of them you will find similar layout of neatly arranged accessories boxes, starting from AMD and Intel mount kits to the miscellaneous stuff like additional fan holder, low noise adapter, fan splitter, thermal paste (Noctua NT-H1). Touching the topic of mount kits, both of the cooler support almost all types of sockets. The NH-U14S comes with a 140 mm fan that goes by the NF-15 PWM model name. The fan is designed in a way it can be installed on coolers that are intended for a 120 mm fan. On the other side, planetary popular Noctuas 120 mm fan, NF-F12, is installed on NH-U12S. While NH-U14S has 6 heat-pipes, NH-U12S has on less or 5 of them that go down onto the base through the aluminium fins. Nickel-plated cooper base has pretty good polished finish, but it’s not that smooth in a “mirror like” way as you might think you could get from a well-priced product like this. You can easily observed that from pictures of CPU contact base that we’ve took. It’s obvious that Noctua didn’t skimp on any part of these coolers, starting from type of used material and the way it processed and finished. This is something that we were spoiled by Noctua and we obviously don’t mind that but rather hope that they will still be at the top of their game as a benchmark for all the other cooler manufactures. If you are more a visual type of person, make sure to check out our video unboxing! Since we got five different additional fans, two of them came with the coolers (140 mm NF-A15 PWM with NH-U14S and 120 mm NF-F12 PWM with NH-U14S), we couldn’t resist into going further with cooler review, without doing a quick overlook of additional fans. Besides the already mentioned ones, we had a chance to play with NF-S12A ULN, NF-12A FLX and NF-S12A PWM. As you can see the core model name is the same (NF-S12A), the three letters that come after that are what makes the difference. Comparing the PWM version of NF-S12A with the included NF-F12 PWM in the NH-U12S package, you can easily noticed that S12A is a superior model. NF-S12A offers greater airflow within lower rotation speed and noise, but with one handout – less static pressure. NF-S12A are designed on different technical level, starting from wings to some other structural points. You can it clearly from pictures that we’ve took. Other two variation of NF-S12A are essentially the same product with different kind of rotation speeds and accessories. As we touch the topic of accessories, all of the Noctua’s fans come with pre-installed and removable anti-vibration skids, four anti-vibration mounts, PWM Y-cable, longer extension cable cable and L.N.A. (Low Noise Adapter) or U.L.N.A. (Ultra Low Noise Adapter) cable. While testing, all the vents were practically inaudible to the naked ear at a half to one meter distance on our open test bed, even with push-pull setup of 120 mm fans. The only thing that we’ve managed to hear and notice substantially is from the 140 mm dual fan setup of NF-A15 that made some whizzing sound. That was probably from the air flow rather than the bearings or something else. As you can see for yourself, everything is on the spot with Noctua’s fans, but… As you know, there’s always a “but” catch somewhere and this one is pretty obvious in recall of something that we already said before. 20+$ for a fan is everything expect cheap and there’s not that much variety of colors to choose from. Personally we’re O.K. with this color scheme, but there aren’t so many PC builds that could go along with it. Maybe with new Asus gold motherboards? Installation that Noctua provides for their coolers is one of the best if not the best that we’ve seen. It’s very easy and almost self-explanatory and laid out within the appropriate mount kit, we’ve managed to install it without any instruction. Beside that Noctua will make sure that you receive a new mount, or a modified part of the current one, for any other future sockets to come. You can see that Noctua really cares about details like that and sometimes those details are what makes the difference to some customers when buying in a product. Backplate of the cooler for the motherboard is very sturdy, full and thick steal with furred soft padding that perfectly leans onto the motherboards backplate. Sitting backplate on its place provides mounting-plates to be installed onto a rubber distancers. After putting Noctua’s thermal paste we’ve put and tightened up the cooler using the crossbar plate. There’s no need to put more pressure right after the screws “refuse” to spin more while using light force. The same goes for the screws that hold mounting-plates, “thumb force” is enough for them. Leaving the smaller NH-U12S, its bigger brother could get you into “territorial” troubles. Depending on a motherboard type and the layout of PCI-e slots, it can easily block the first one, but on the lighter note, RAM clearance, including the NH-U12S, is on the spot with both of the current generation Intel LGA 2011 and LGA 1150 platformsYou will have to pull down the fans so could screw down the screws, but on the lighter note fans are very easy to pull down (and up) with clips (you get additional clips for second fan). We did all the tests runs at a room temperature of 23°C (fluctuation rate is around 1-2 °C). Using the AIDA64 Extreme (v3.00.2500) monitored and performed our testing, leaving the EIST, C1E and Turbo enabled, but with a fixed CPU voltage. Those there feature are not of that big of concern when it comes to measuring since we measured only at load. As both of the models include LNA and we had two vents for each of them, at the end we came up with 12 different scenarios of load testing for each cooler measuring at load stock (3,9 GHz Turbo @1,100V), 4,4 GHz (1,220V) and 4,6 GHz (@1,300V) of our Ivy Bridge Core i7 – 3770K. Since Noctua sent us more than enough fans to play with, our tests were undertaken in a push-pull scenario as well as a “classic” and default one fan testing on a open test bed.We let the fans be automatically monitored by BIOS through all our testing. We didn’t bother to test the idle temperatures as you can expect that almost all coolers run pretty similar and within small margins of differences between them. Our opinion is that load is what matters the most, especially when we get into overclocking. That’s when you will see the difference in performance when comparing multiple models of coolers. We did a load test using the AIDA’s stability test run-through in range of 10 – 25 minutes, but most of the case after that was right after 10 minutes mark as that was a point in time where the temperatures of cores pretty much stayed / fluctuated at the same level. 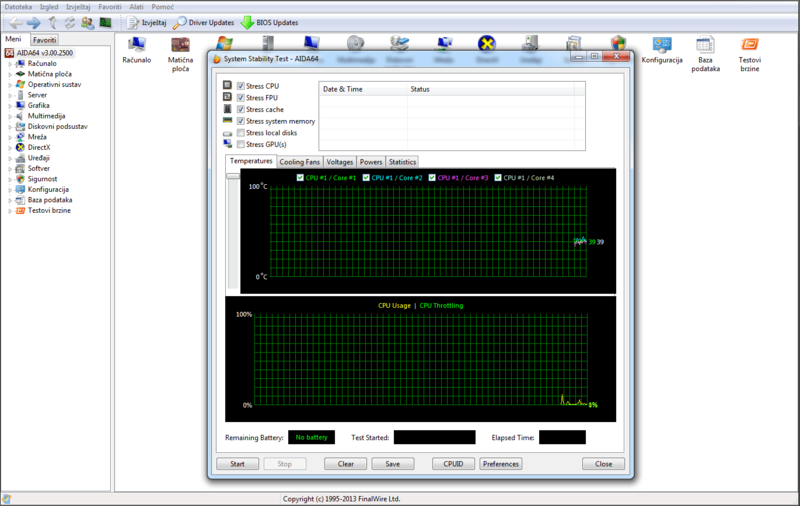 AIDA’s stability test consists of stressing the CPU, its FPU and cache, and in our case additional the system memory. While it will sky-rocket the processor and its cores / threads utilization to 100% at 99% of time, realistically it won’t represent an real end user scenario like playing some games or even rendering doings. First thing’s first, let’s start with a bigger brother. Performance wise, as you will see further ahead, there’s no compromise. NH-U14S handled the stock i7-3770K with no problem and with expected results roaming around. Putting both fans in use you can see that temperature spikes don’t go that high as they did without dual fan setup, and temperatures are more roaming around 48-53°C than the 55°C mark that’s seen with one fan. Using LNA on one fan setup cores go high as 58-62°C and with dual fan combination it more around 54-56°C on average. Getting into the 4,4 GHz range with fixed 1,220 V, Noctua NH-U14S shows its strength and cooling capabilities. As you can see from our screenshots, at this setup temperature fluctuations are more pronounced, varying from the lowest spikes 60°C to the highest one at little bit over 80°C. To middle and some kind of average of all of that is more around 65-70 °C. It’s really hard to determine specific numbers and temperatures, you can do it yourself from the taken screenshot if you want to, but you can get a general performance overview at this core speeds and voltages. Two fans can play this game also and with them you’ll manage to calm down those temperature spikes and averages for an about 3-5°C. Putting on a LNA adapter on both of the fans gets as back performance wise at the one fan setup level, maybe just slightly better than that. Last bot not least NH-U14S stepped within the 4,6 GHz with fixed 1,300V. Same situation like the one before with 4,4 GHz, temperature fluctuation from 70°C to 90°C with an averages running around 80°C, give or take 5°C, and without CPU throttling. Setting up a dual fan setup we go lower with upper and bottom temperature peaks. It’s still hard to determine the averages, but in this case it’s something along the line 2-3°C below the 80°C mark. Coming down to the smaller unit of this review, at the start we see a lots of good things. Temperatures at stock load are pretty similar to NH-U14S, 2-3°C higher, pretty solid of a single-tower cooler of this size. Under the LNA adapter single fan configuration will take you as high as 60°C (yes, we’re still talking about stock i7-3770K) and with dual fan setup you can get as low as below 50°C but with an average just above it. Going up to the 4,4 GHz mark with a 1,220V on its back, we see the true “nature” of this cooler and how it performers under pressure. Although the temperature drops to 60°C just like with NH-U14S did, averages and peaks are expectedly higher. You can see that Noctua NH-U12S peaks more often above 80°C while the usual temperature area cliffs mostly to the values above 70°C. Surprisingly, in the case of dual fan setup you can see that practically got worse results then with one fan. We could easily blame automatic fan control, but still it’s a bit odd. Using the LNA in dual and single fan setup temperatures went up by 2-3°C as expected. You could say that 4,6 GHz @ 1,300V is for “big boys” only, especially with the hot i7-3770K and it’s awful and unevenly put epoxy based “black glue” below to IHS, but on our surprise little NH-U12S handled that quite well. Although we had some spikes that went little above the 90°C mark, most of the values are between 80-85°C. It’s still hard to determine specific numbers in this case also, but you can see it for yourself and make a judgement. Coming down again with a dual fan push pull setup, we’re once again welcomed with unexpected results. It seems the NH-U12S isn’t a fan of a dual fan setup (just made a joke there, badum – tsss), cause at this temperatures automatic fan control usually ramp up RPM’s to maximum and on the other side we had NH-U14S which preformed logical better in dual fan environment. We won’t jump to conclusions, but we will certainly, for the future reference’s, try to perform tests within a predefined value of fan speed on the tested coolers. It’s possible that automatic fan regulation had its part with giving out an uncommon results, but on the other side we are scratching our heads cause we didn’t have that anomaly with the NH-U14S. The NH-U14S just “killed it” and the smaller brother wasn’t limping behind either. Looking again upon the results of both coolers, it’s perfectly clear why is Noctua is associate with the top notch products for its segment. As we mentioned several time before, price wise Noctua is a bit higher on a scale compared to other brands, but still, it has lot to offer performance wise, build quality and everything else that we’ve mentioned through our overview and review both of coolers. The only thing that doesn’t go these coolers in favour regarding their price is the fact they are walking into closed water cooling territory, but on the other hand water coolers in that range don’t provide similar performance. 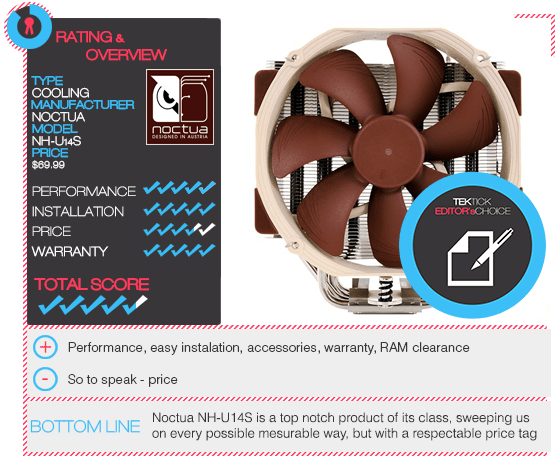 The Noctua NH-U14S review and the product itself hands down deserved our “Editors choice” award. Performance and sense of top the notch build quality made this decision much easier for us. Coming down to the NH-U12S review, there’s nothing bad we can tell about this model, expect its price maybe, as it’s in a way pretty similar to its larger brother. Starting from build quality, accessories, ease of installing, everything is pretty much the same, within a smaller, compact and a bit cheaper product. Yes, it’s relativity on par with NH-U14S leaving the performance aside. It’s obvious and expected that NH-U12S lacks some of the NH-UH12S performance , but for its segment and shire size, it’s for certain well above the average comparing it with similar sized air CPU cooling solution. Nevertheless, even with the Noctua’s NH-U12S slightly higher price than its rivals, we are still undoubtedly giving it our “Best Buy” award.